For ages, humankind has dug into the mysteries surrounding the exact composition of the universe. Ancient Greeks were the first to surmise the existence of atoms, which they believed to be the smallest particles in the universe—the “building blocks” of everything. For about 1,500 years, that was the most we knew about matter. Then, in 1897, the discovery of the electron left the scientific world in a shambles. Just as molecules were made of atoms, now the atoms appeared to have their own ingredients. Let’s start with something closest to what we already know—quarks. There is more than one type of quark: six, to be exact. “Up” and “down” quarks are the most common types, and these are what build into the protons and neutrons of atoms. “Strange” quarks, on the other hand, aren’t so common. When strange quarks combine with up and down quarks in equal numbers, they create a particle called a strangelet, and strangelets are the wispy fragments that build into strange matter. Now, according to the strange matter hypothesis, strangelets are created in nature when a massive neutron star—a high-mass collapsed star—builds so much pressure that the electrons and protons in its core fuse together, then collapse further into sort of a dense quark bubble, which we call strange matter. And since large strangelets can theoretically exist outside of those high pressure center-of-a-star environments, it’s likely that they’ve floated away from those stars and into other solar systems—including our own. And this is where it gets crazy: if these things did exist, a large strangelet would be able to convert an atom’s nucleus into another strangelet by colliding with it. The new strangelet could then collide with more nuclei, converting them into more strangelets in a chain reaction until all the matter on Earth had been converted into strange matter. In fact, the Large Hadron Collider facility had to put out a press release stating that they were unlikely to accidentally create strangelets that could destroy the planet. That’s how seriously the scientific community takes the matter of strangelets. The theory of supersymmetry states that every particle in the universe has an opposite twin particle—known as a supersymmetric particle, or sparticle. So for every quark out there, there’s a sister—a squark—that shares perfect symmetry with it. For every photon, there’s a photino. And so on for all sixty-one known elementary particles. So if there are so many of them, why haven’t we discovered any of these sparticles yet? Here’s the theory: in particle physics, heavier particles decay faster than lighter particles. If a particle gets heavy enough, it breaks down almost immediately once it’s created. So assuming the sparticles are incredibly heavy, they would break down in the blink of an eye, while their superpartners—the particles we can see and observe—live on. This could also explain why there’s so much matter in the universe yet precious little dark matter, because the sparticles could comprise dark matter and exist in a field which is—so far—unobservable. Matter is made of particles—and in a similar way, antimatter is made of antiparticles. This all makes sense, right? Antiparticles have the same mass as normal particles, but an opposite charge and an opposite angular momentum (spin). It sounds like the supersymmetry theory, but unlike particles, antiparticles behave just like particles—even building into anti-elements, like antihydrogen. Basically, all matter has corresponding antimatter. Or at least, it should. That’s the problem—there’s plenty of matter around, but antimatter just doesn’t really show up anywhere. (Except the Large Hadron Collider—full disclosure, antiparticles have been found and are no longer theoretical). During the Big Bang, there should have been equal numbers of particles and antiparticles. The idea is that all matter in the universe was created at that point. So by default, all antimatter had to be created at the same time. One theory is that there are other parts of the universe dominated by antimatter. Everything we can see, even the most distant stars, is mostly matter. But our visible universe could only be one small section of the universe, while antimatter planets and suns and galaxies swarm in a different sphere of the universe, like opposite-charged electrons and protons revolving around each other in an atom. Right now, antiparticles are a huge problem in current particle physics theories. Care to hear about another problem? Gravity. Compared to other forces, like electromagnetism, gravity is weaker than sneezing your way through a fist fight. It also seems to change its nature based on the mass of an object—gravity is easy to observe in planets and stars, but get it down to the molecular level and it seems to do whatever it wants. And in additional to all that, it doesn’t even have a particle to carry it, like the photons that carry light. That’s where the graviton comes in. The graviton is the theoretical particle that would—sort of—allow gravity to fit in the same model as every other observable force. Because gravity exerts a weak pull on every object, regardless of distance, it would have to be massless. But that’s not the problem—photons are massless and they’ve been found. We’ve gone so far as to define the exact parameters that a graviton would have to fit into, and as soon as we find a particle—any particle—that matches those parameters, we’ll have a graviton. Finding it would be important because, as of now, general relativity and quantum physics are incompatible. But at a certain precise energy level, known as the Planck scale, gravity stops following relativity rules and slips into quantum rules. So solving the gravity problem could be the key to a unified theory. There’s another theoretical gravitation particle, and it’s absolutely beautiful. The graviphoton is a particle that would be created when the gravitational field is excited in a fifth dimension. 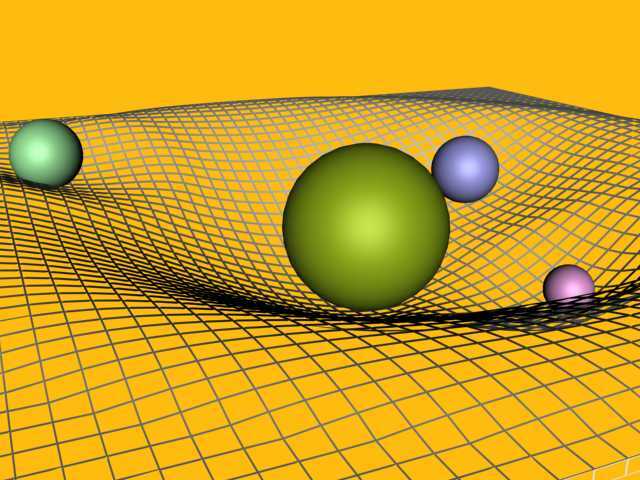 It comes from the Kaluza Klein theory, which proposes that electromagnetism and gravitation can be unified into a single force under the condition that there are more than four dimensions in spacetime. A graviphoton would have the characteristics of a graviton, but it would also carry the properties of a photon and create what physicists call a “fifth force” (there are currently four fundamental forces). Other theories state that a graviphoton would be a superpartner (like a sparticle) of gravitons, but that it would actually attract and repel at the same time. By doing that, gravitons could theoretically create anti-gravity. And that’s only in the fifth dimension—the theory of supergravity also posits the existence of graviphotons, but allows for eleven dimensions. What are quarks made of? First of all, let’s get an idea of scale. The nucleus of a gold atom has seventy-nine protons. Each proton is made of three quarks. Now, the width of that gold atom’s nucleus is about eight femtometers across. That’s eight millionths of a nanometer, and a nanometer is already one billionth of a meter. So let’s just agree that quarks are small, and realize that preons—sub-quark particles—would have to be so infinitesimally small that there is no scale right now which could measure their size. There are other words used to describe the theoretical building blocks of quarks, including primons, subquarks, quinks, and tweedles, but “preon” is generally the most accepted. And preons are important because right now, quarks are a fundamental particle—they’re as low as you can go. If they were found to be composite, or made of other pieces, it could open the door to thousands of new theories. For example, one theory right now states that the universe’s elusive antimatter is actually contained in preons, and therefore everything has bits of antimatter locked inside it. According to this theory, you’re part antimatter yourself—you just can’t see it because the matter pieces build into bigger blocks. Nothing comes closer to breaching the known laws of relativity than a tachyon. It’s a particle that moves faster than light, and if it existed it would suggest that the lightspeed barrier is . . . well, no longer a barrier. In fact, it would mean that the speed we know of as the speed of light would be the center point—just as normal particles can move infinitely slow (not moving at all), a tachyon existing on the other side of the barrier would be able to move infinitely fast. Bizarrely, their relationship to the speed of light would be mirrored. To put it simply, when a normal particle speeds up, its energy needs increase. To actually break through the lightspeed barrier, its energy needs would rise to infinity—it would need infinite energy. For a tachyon, the slower it goes, the more energy it needs. As it slows and approaches the speed of light from the other side, its energy requirements become infinite. But when it speeds up, the energy requirements decrease, until it needs no energy at all to move at infinite speed. Think of it like a magnet—you have one magnet taped to a wall, and another in your hand. When you push your magnet towards the wall with the poles aligned, your magnet is repelled. The closer you put it, the harder you need to push. Now imagine on the other side of the wall is another magnet, doing the same thing. The wall magnet is the speed of light, and the two magnets are tachyons and normal particles. So even if tachyons did exist, they would be forever trapped on the opposite side of a barrier which we ourselves can’t pass. Although, we’ve forgotten to mention that they could technically be harnessed to send messages into the past. Nearly all of the particles we’ve talked about so far are called point particles; quarks and photons exist as a single point—a tiny little dot, if you will—with zero dimensions. String theory suggests that these elementary particles aren’t actually points at all—they’re strings, one dimensional particle strands. At its core, string theory is a Theory of Everything that manages to coexist with both gravity and quantum physics (based on what we know right now, those two can’t physically exist in the same space—gravity doesn’t work at the quantum level). So in a broad sense, string theory is actually a quantum theory of gravity. And for comparison, strings would replace preons as the building blocks of quarks while at higher levels everything remains the same. And in string theory, the string can turn into anything based on the way it’s shaped. If the string is an open strand, it becomes a photon. If the ends of that same string connect and form a loop, it becomes a graviton—in much the same way that the same piece of wood can become either a house or a flute. There are actually multiple string theories, and interestingly, each one predicts a different number of dimensions. Most of these theories state that there are ten or eleven dimensions, while Bosonic string theory (or superstring theory) calls for no less than twenty-six. In these other dimensions, gravity would have an equal or greater strength than other fundamental forces, explaining why it’s so weak in our three spatial dimensions. If you really want an explanation of gravity, you have to look to M-theory, or Membrane theory. Membranes, or branes, are particles that are able to encompass multiple dimensions. For example, a 0-brane is a point-like brane that exists in zero dimensions, like a quark. A 1-brane has one dimension—a string. A 2-brane is a two-dimensional membrane, and so on. Higher dimensional branes can have any size—leading to the theory that our universe is really one large brane with four dimensions. That brane—our universe—is just a piece of multi-dimensional space. And as for gravity, our four-dimensional brane can’t simply contain it, so gravity’s energy leaks into other branes as it passes them in the multi-dimensional space; we just have the dribbles of what’s left, which is why it seems so weak compared to other forces. Extrapolating that, it makes sense that there are many branes moving through this space—infinite branes in an infinite space. And from there we have the multiverse and cyclic universe theories. The latter states that the universe cycles itself: it expands from the energy of the Big Bang, then gravity pulls everything back into the same space for the Big Crunch. That compression energy sets off another Big Bang, bouncing the universe into another cycle, like a cell flaring into life and then dying. The Higgs boson, more commonly known as the God particle, was tentatively found on March 14, 2013, in the Large Hadron Collider (9). As a little bit of background, the Higgs boson was first hypothesized in the 1960s as the particle that gives mass to other particles. Basically, the God particle is produced in the Higgs field and was proposed as a way to explain why some particles that should have had mass were actually massless. The Higgs field—which had never been observed—would have to exist throughout the universe and provide the force needed for particles to acquire their mass. And if that were true, it would fill huge gaps in the Standard Model, which is the basic explanation of literally everything (except, as always, gravity). The Higgs boson is vital because it proves that the Higgs field exists, and explains how energy inside the Higgs field can manifest as mass. But it’s also important because it sets a precedent; before it was discovered, the Higgs boson was just a theory. It had mathematical models, physical parameters that would allow it to exist, how it should spin—everything. We just didn’t have any evidence of its existence whatsoever. But based on those models and theories, we were able to pinpoint a specific particle—the smallest thing in the known universe—that matched everything we’d hypothesized. If we can do it once, who’s to say that any of these particles couldn’t be real? Tachyons, strangelets, gravitons—particles that would shift everything we know about life and the universe and bring us closer to actually understanding the fundamentals of the world we live in.